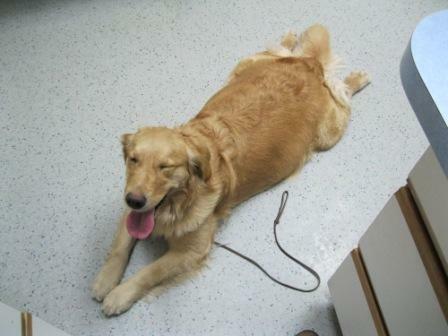 Piper waiting for x-rays at vet...doesn't she look comfortable? 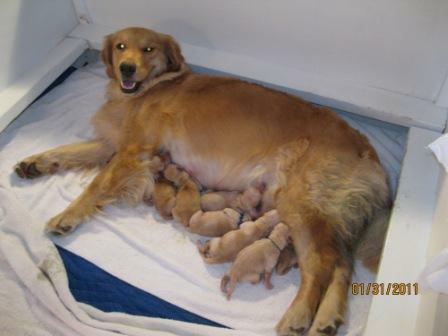 7 babies!! 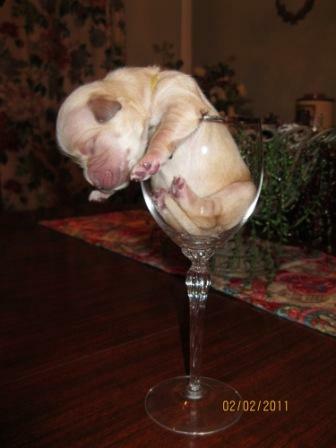 That explains it! 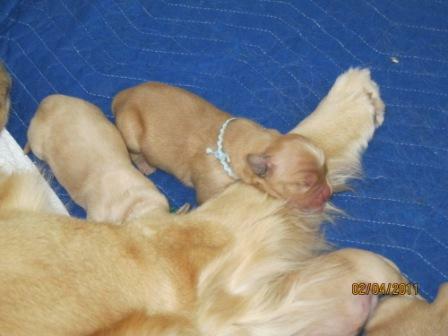 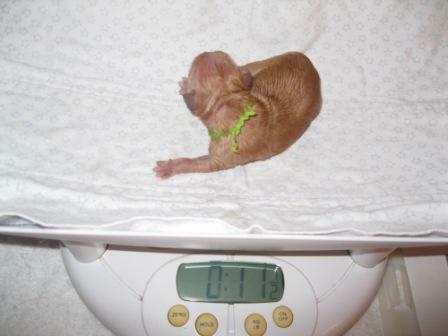 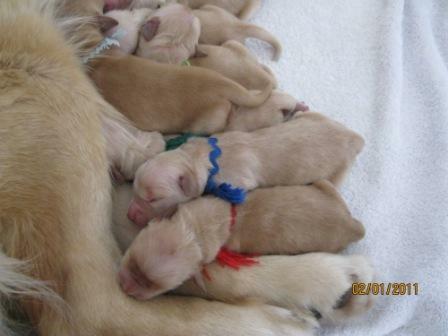 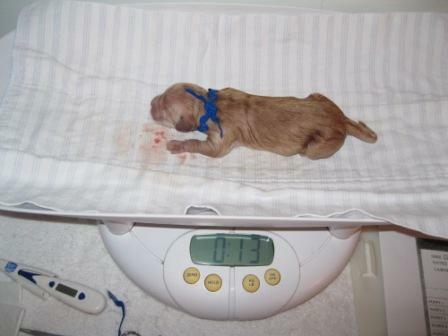 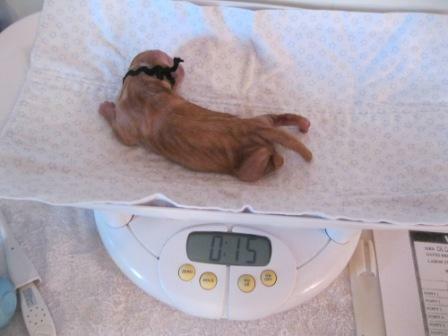 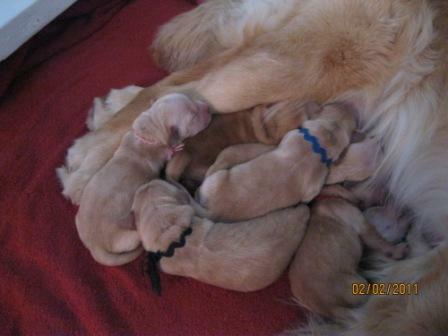 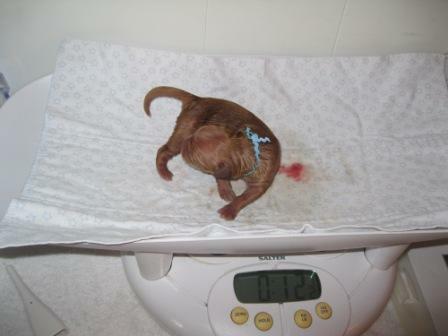 Red Girl "Lily", Dark Blue Boy "Nacho"
The "Great Eight" are one day old! 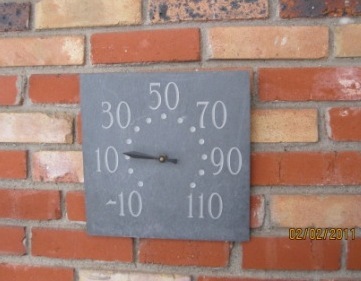 The coldest morning in 15 years!????? 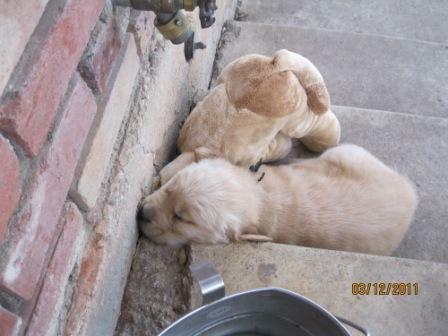 The warmest place in Texas!! 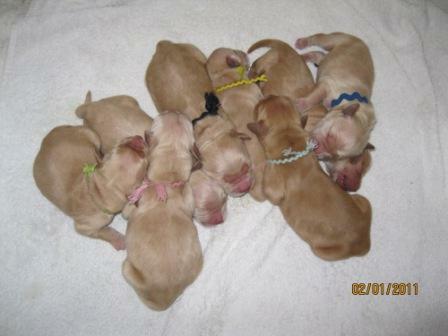 Megan and Yellow Girl "Erin"
Pink Girl "Candice", and Blue Boy "Nacho"
Blue Boy "Nacho" and Yellow Girl "Erin"
Black Boy "Parker" and Lime Green Girl "Alessandra"
Pink Girl "Candice" 1 week old today!! 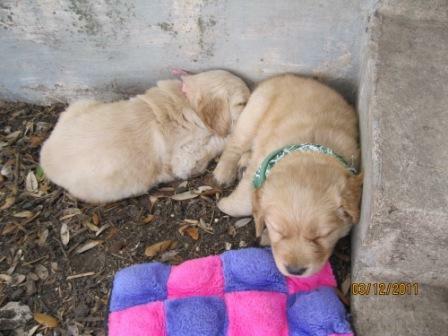 Light Blue Boy "Julian", and Yellow Girl "Erin"
Piper and Lime Green Girl "Allesandra"
Red Girl "Lily"...such spoiled puppies! 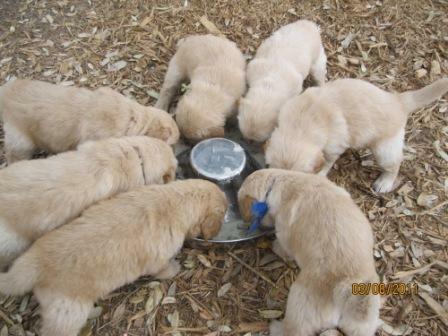 First drink of water...turned into first bath for several pups! 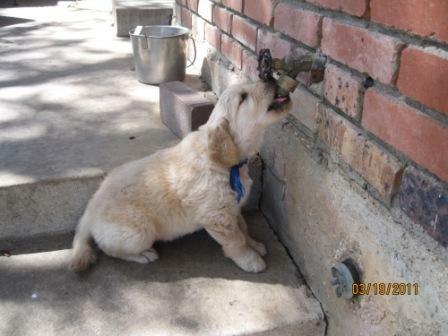 Nacho and Lily LOVE the water bowl! 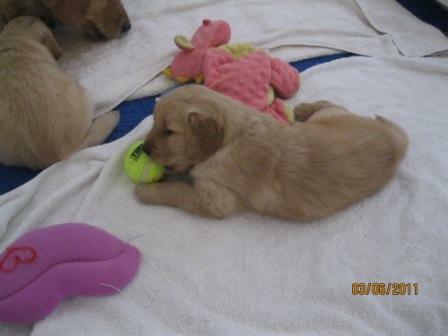 Lily and her 1st tennis ball! 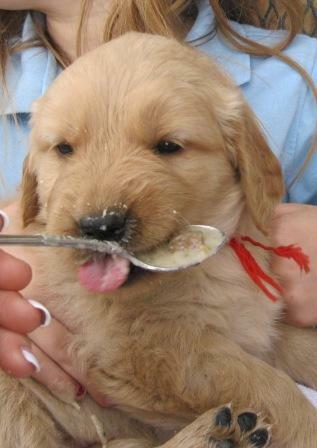 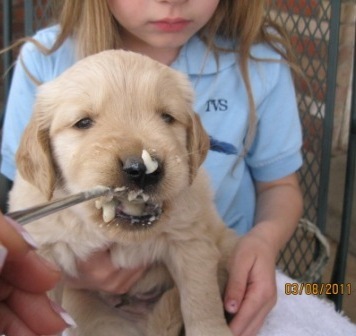 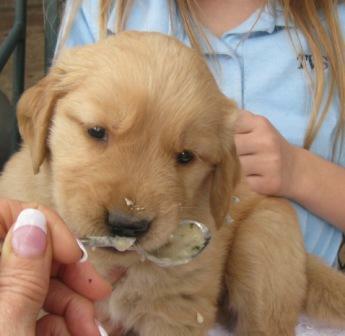 The first taste of "real " food! 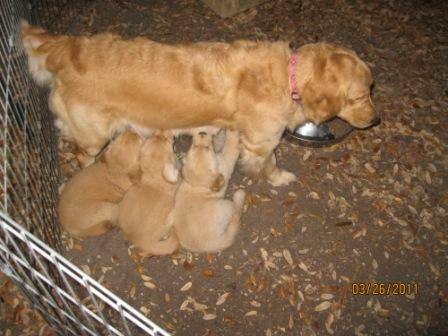 The whole gang LOVES to eat! 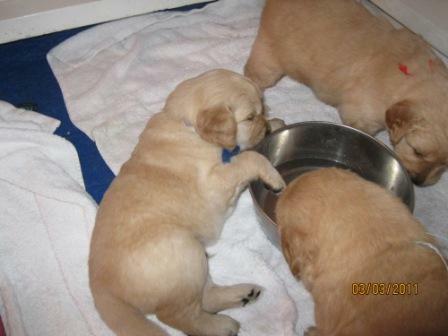 Julian...the food bowl is for EATING, not SLEEPING! 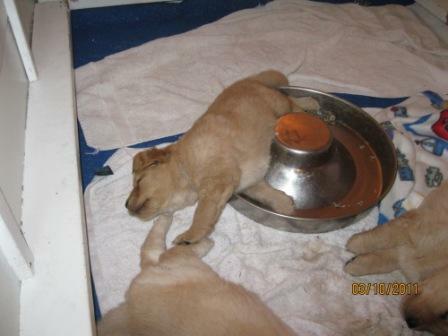 Julian sleeping in the bowl...AGAIN! 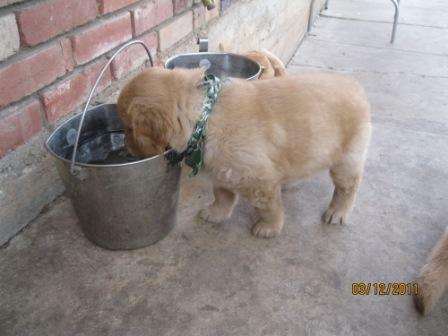 Nacho...try the water bowl buddy! 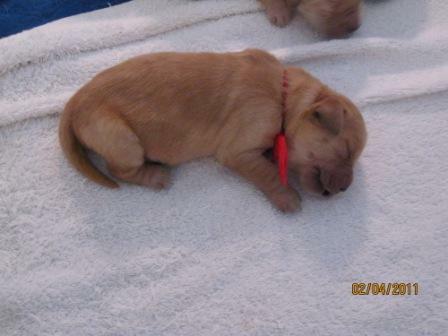 Julian..."Can I go back to sleep now?" 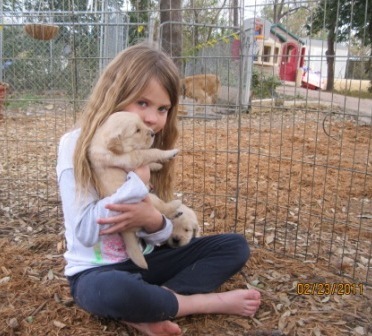 Allesandra has grown a bit! 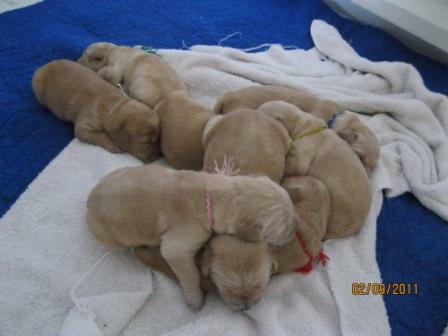 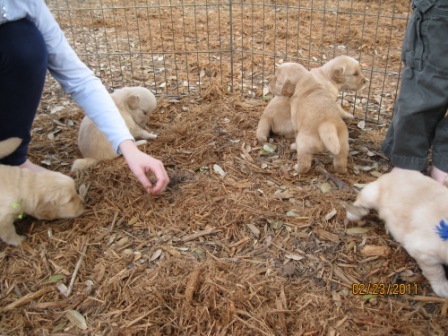 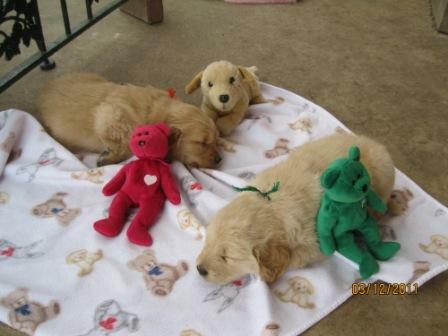 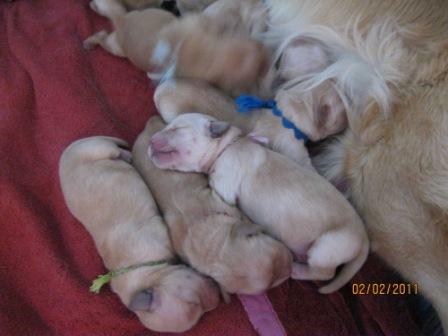 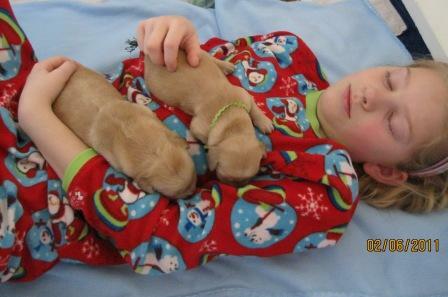 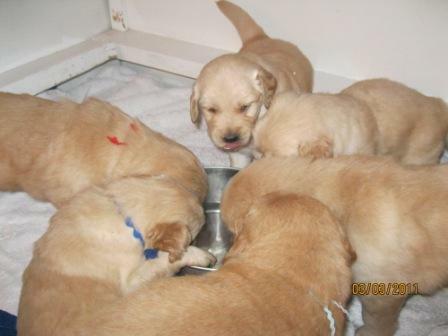 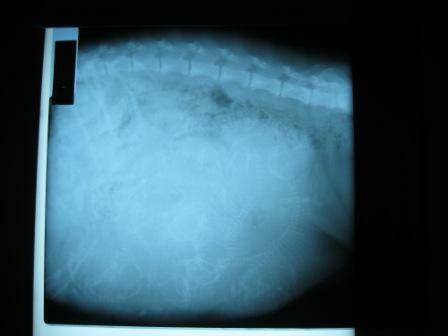 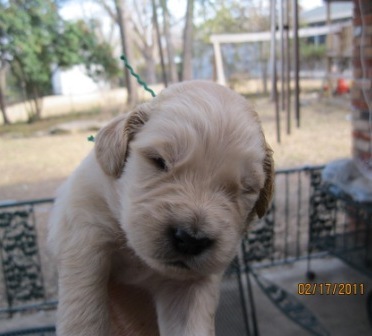 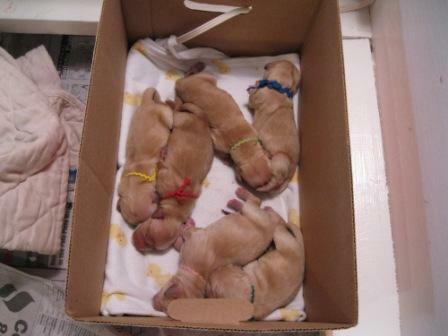 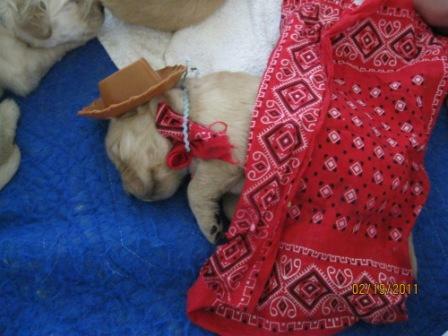 The puppies started going to their new homes on March 26. 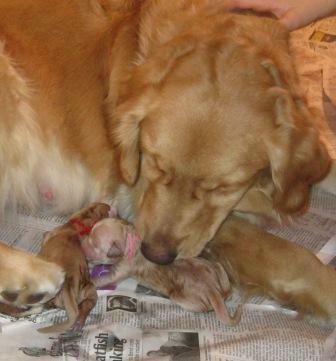 This is always sad for us, but we know how happy our babies will be with their wonderful new families! 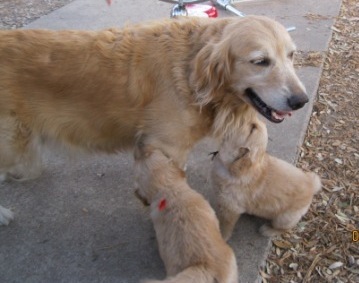 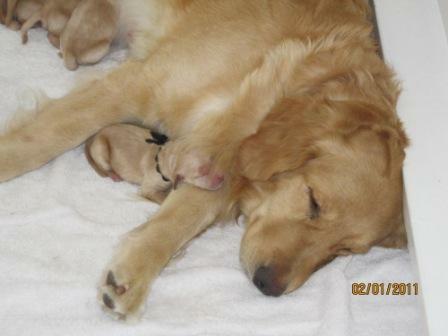 How blessed we are to have such wonderful Goldens to live with us, and such incredible families to take our babies into their lives. 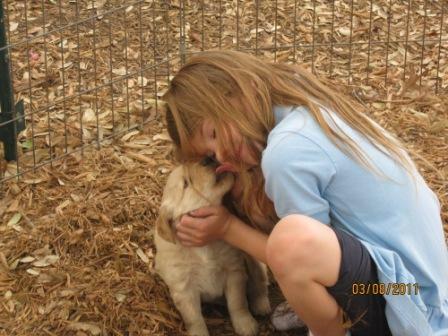 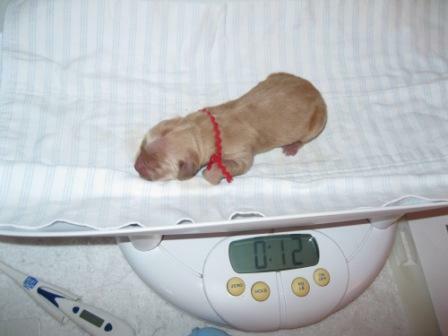 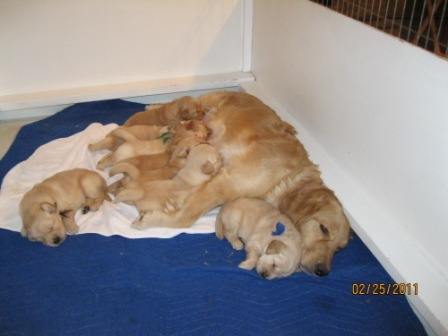 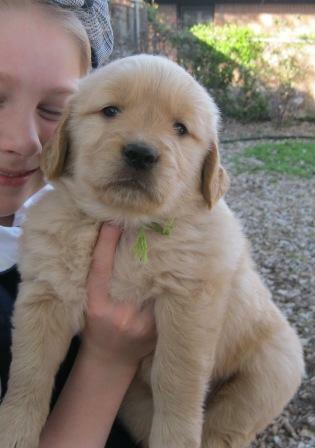 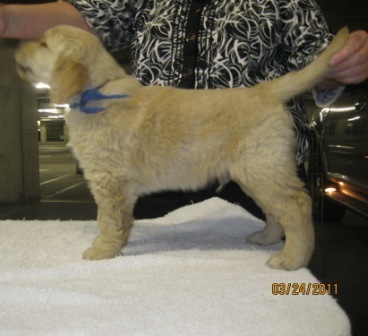 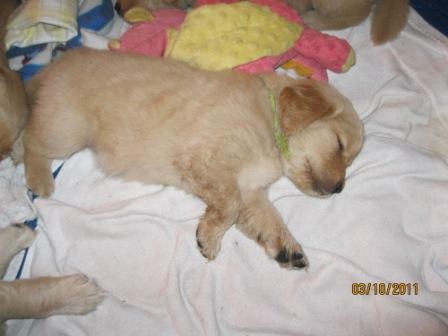 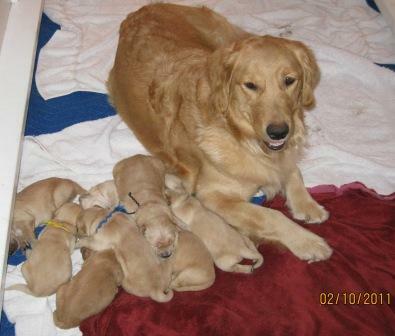 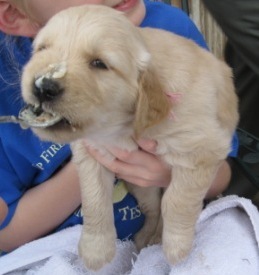 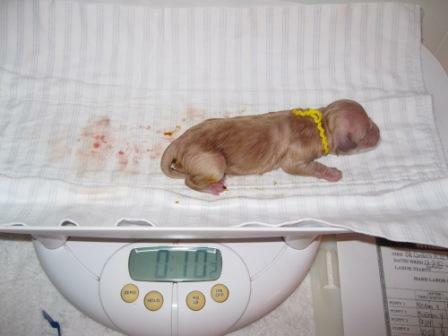 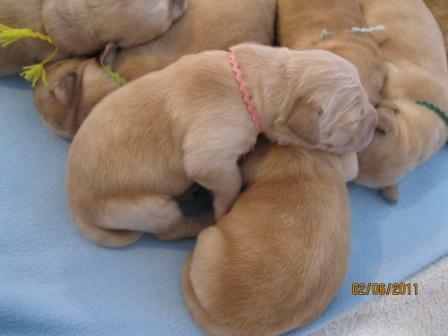 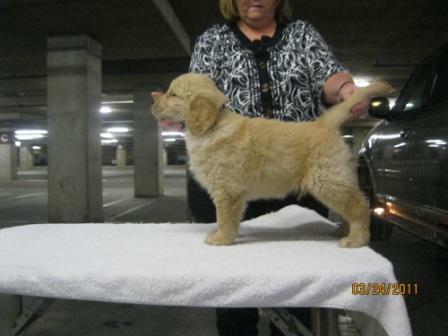 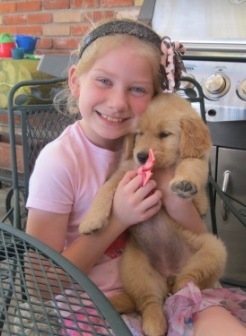 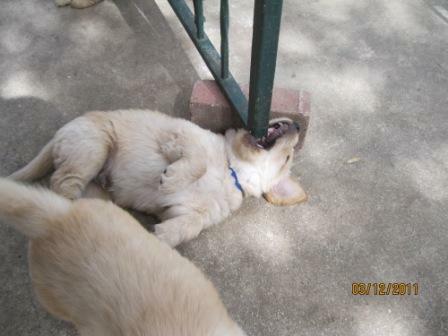 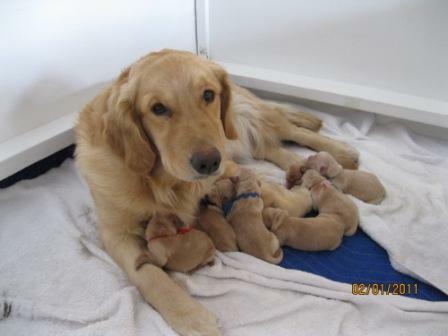 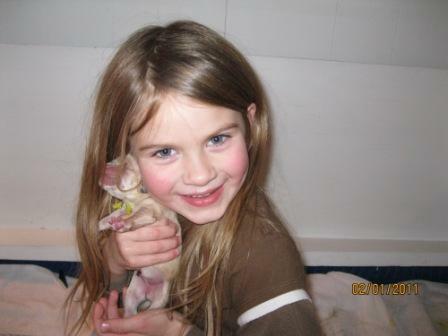 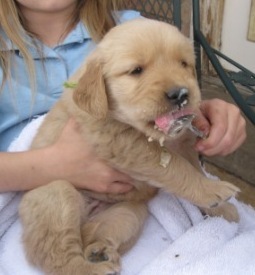 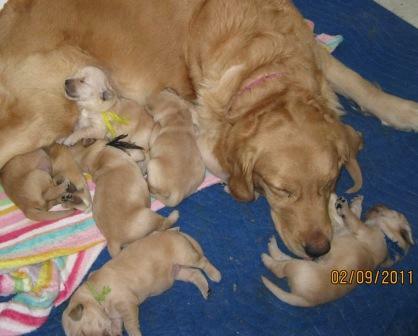 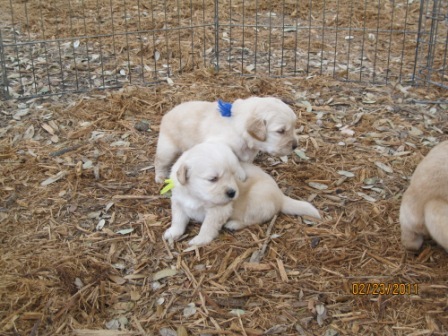 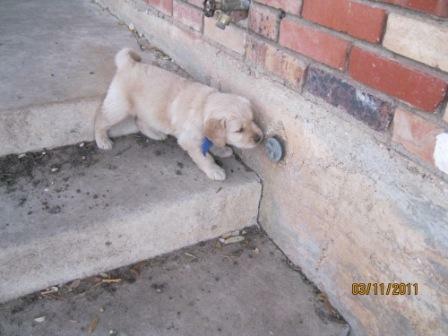 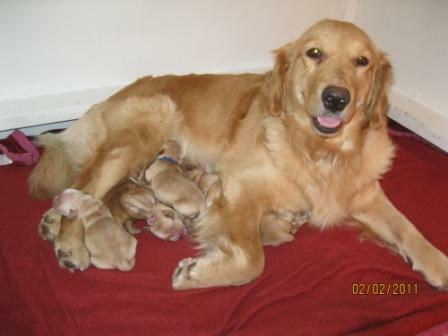 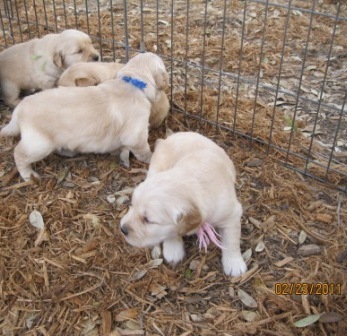 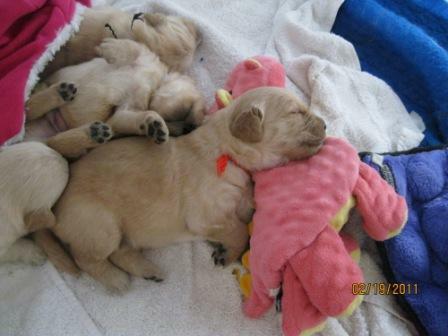 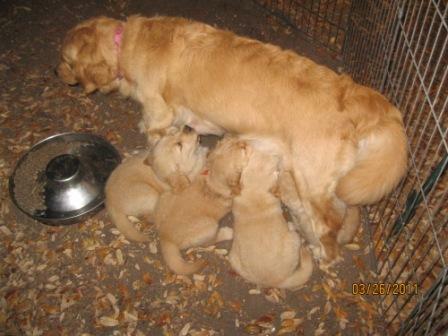 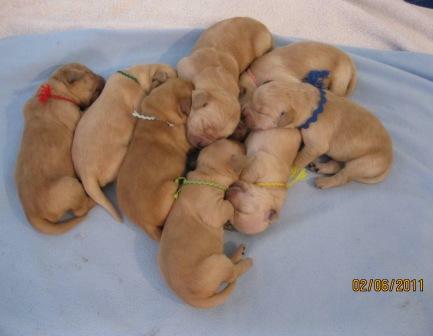 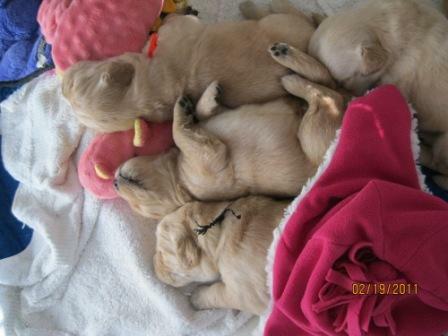 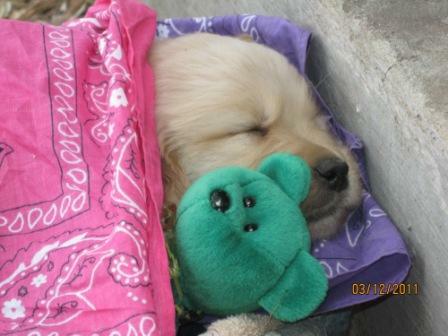 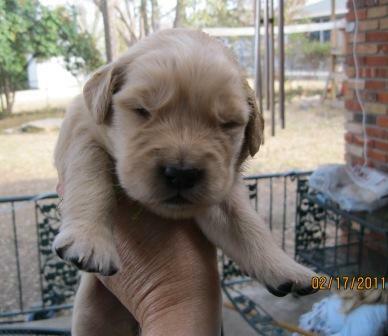 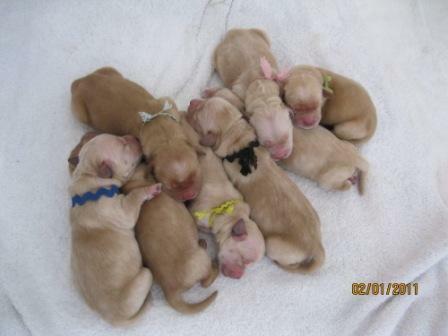 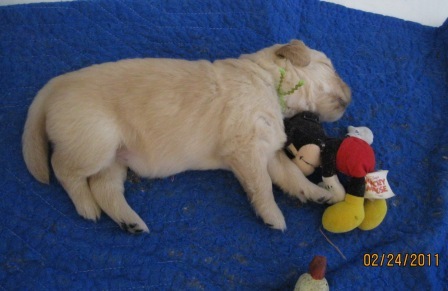 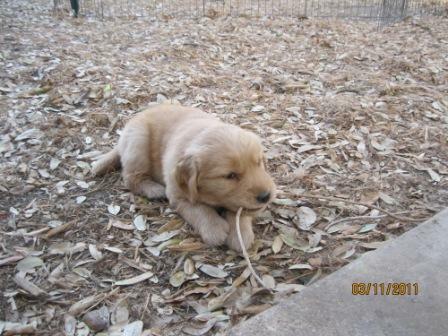 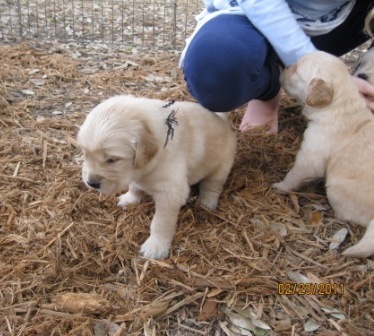 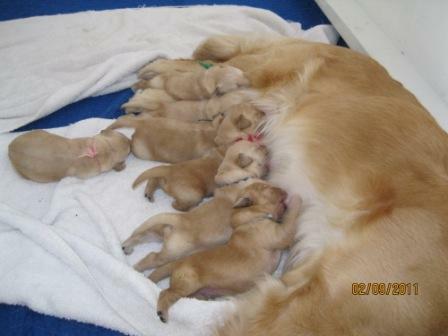 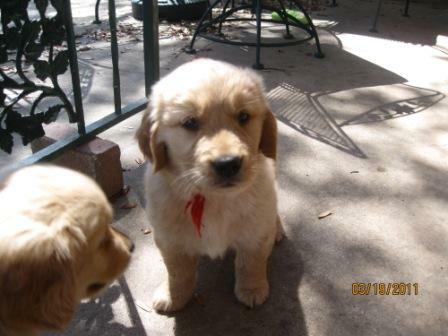 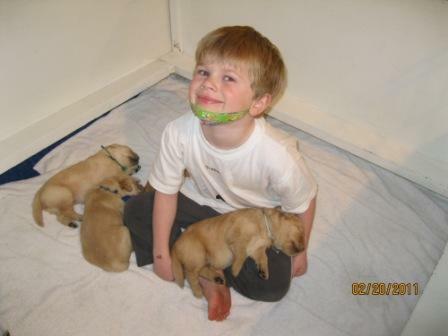 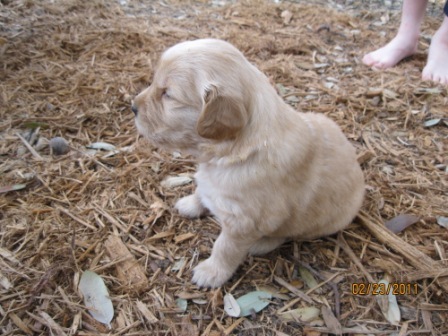 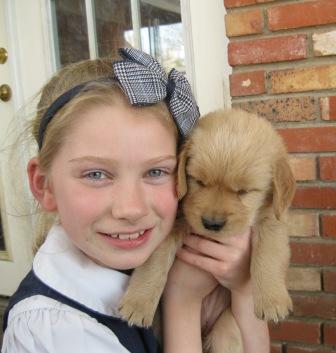 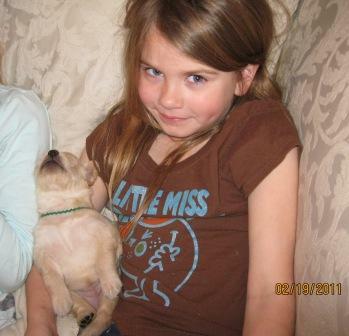 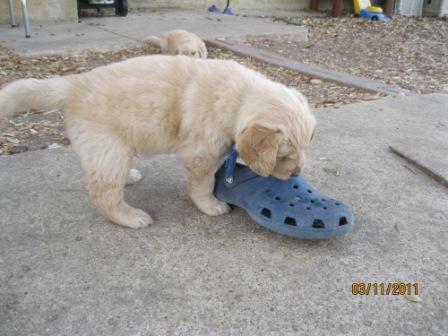 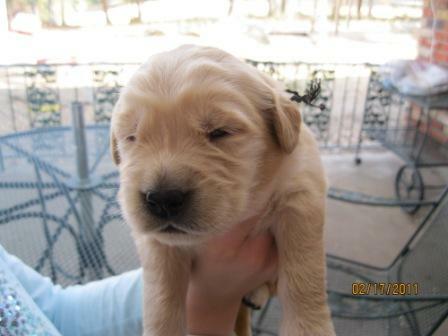 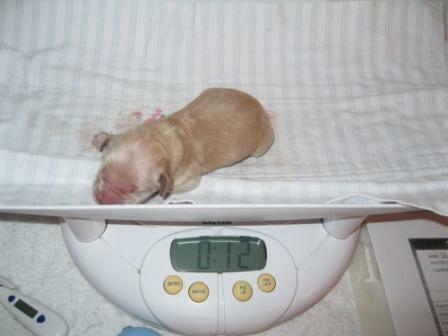 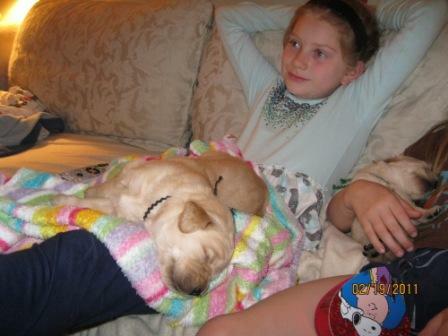 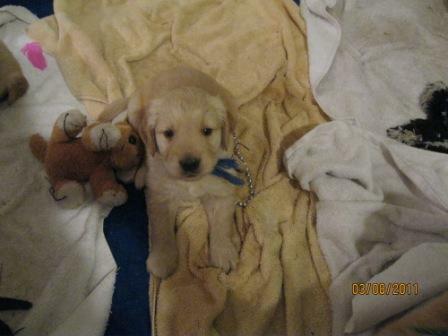 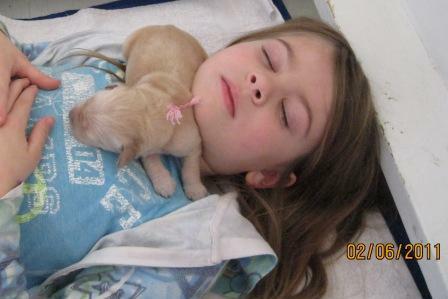 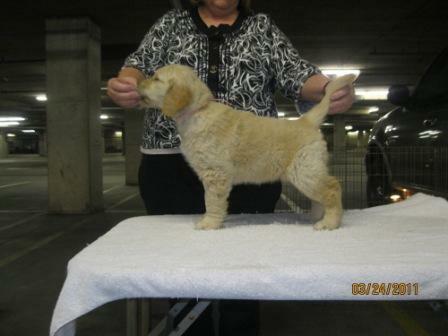 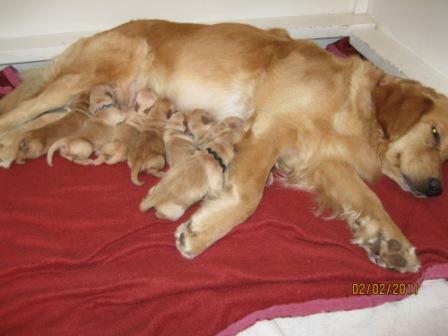 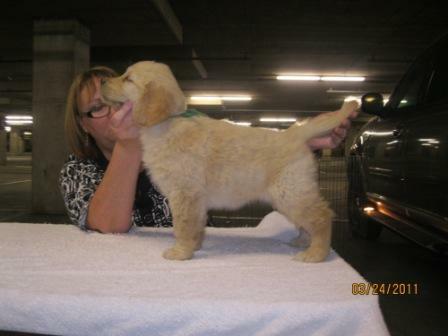 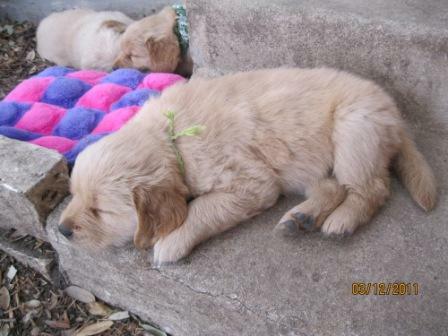 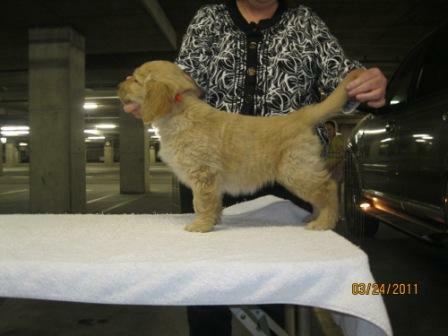 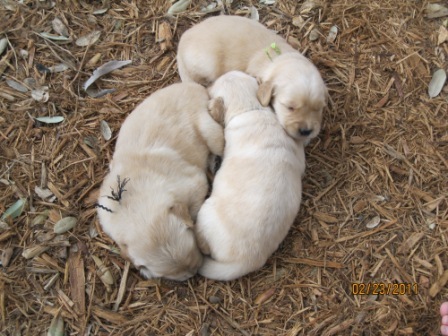 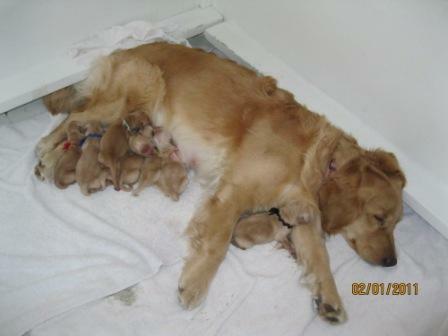 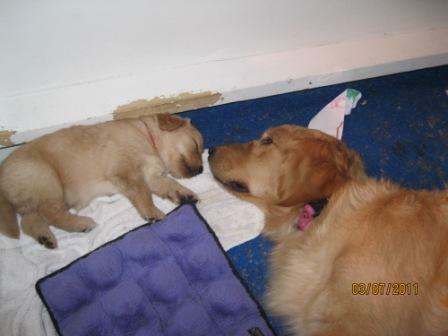 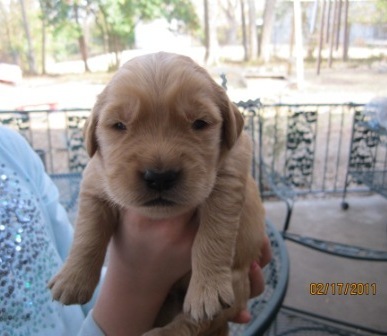 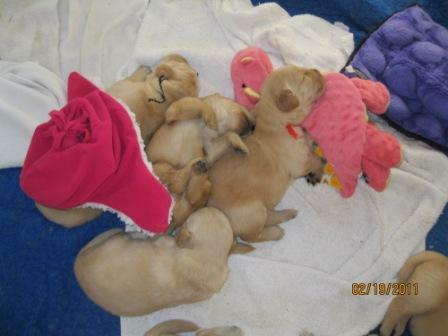 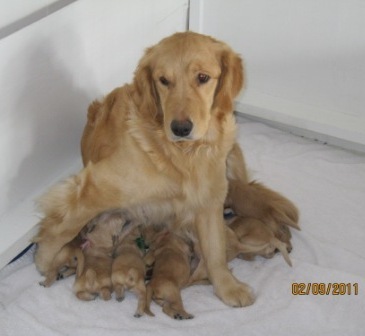 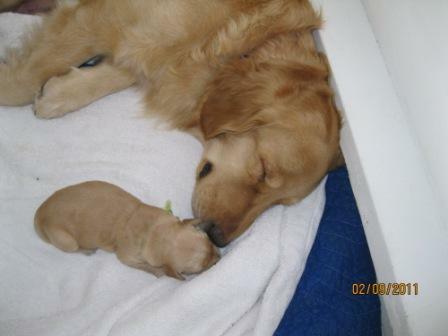 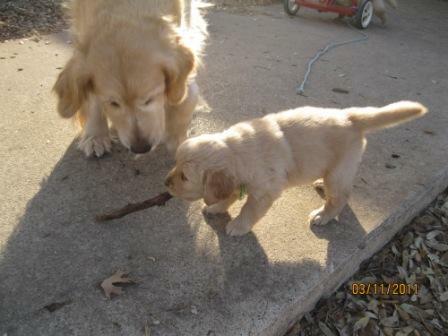 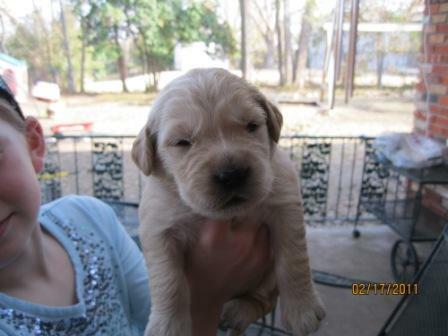 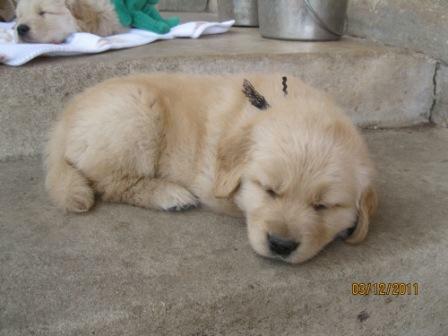 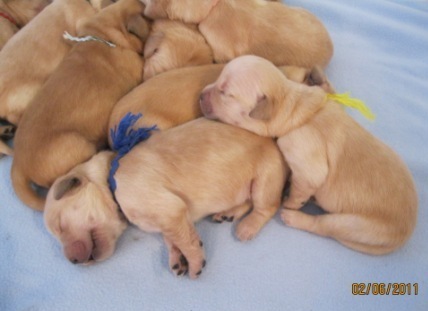 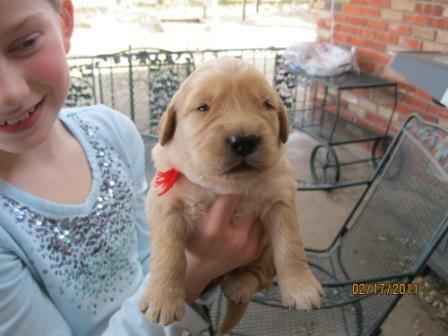 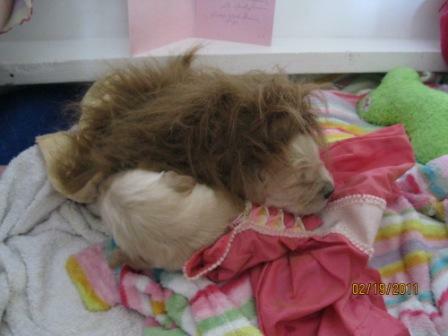 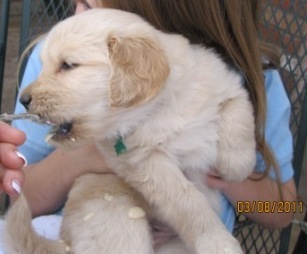 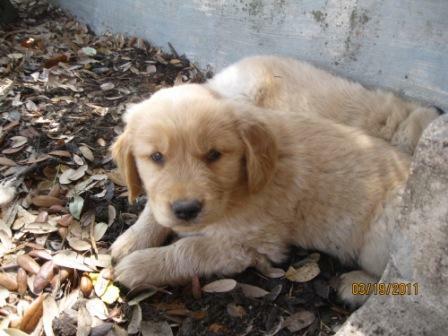 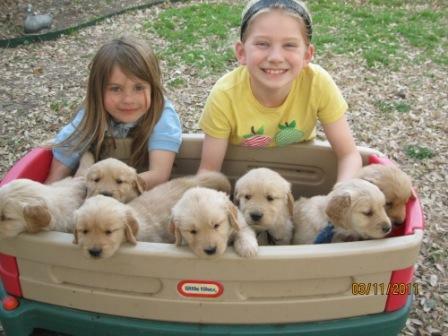 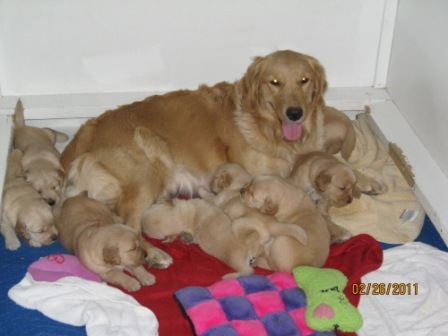 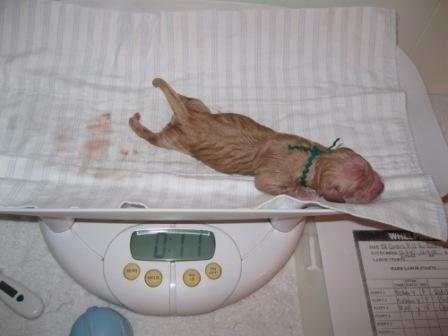 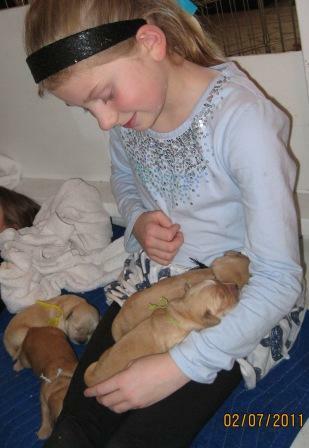 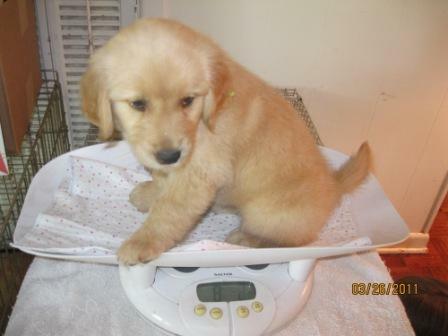 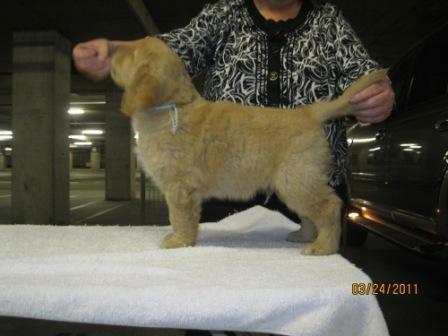 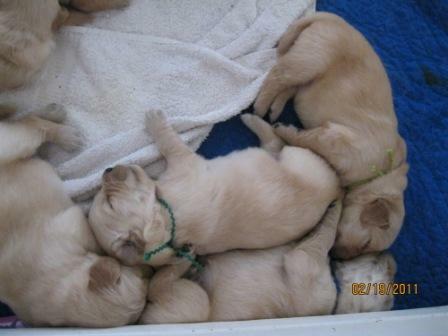 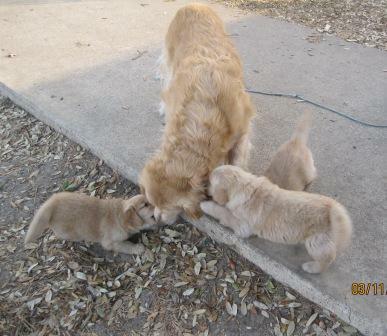 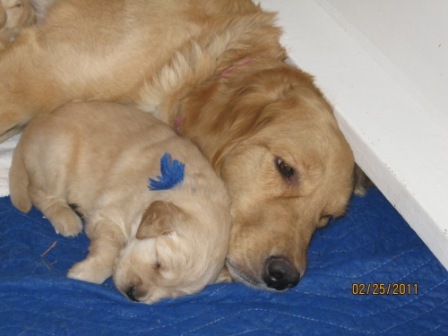 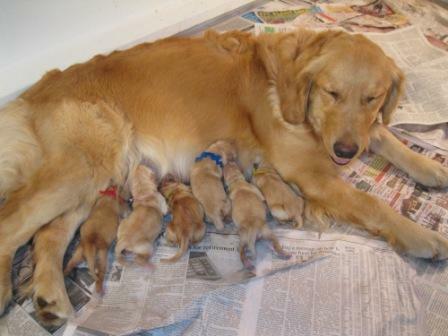 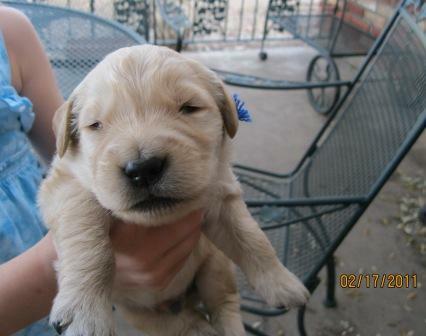 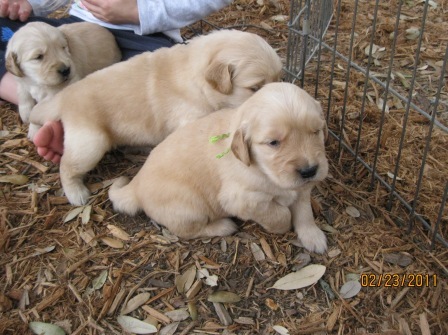 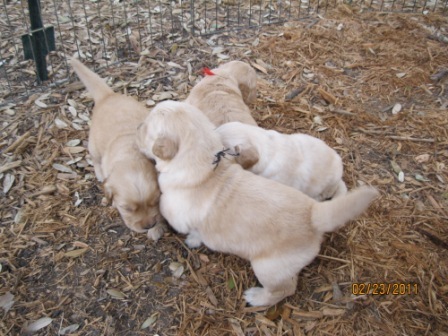 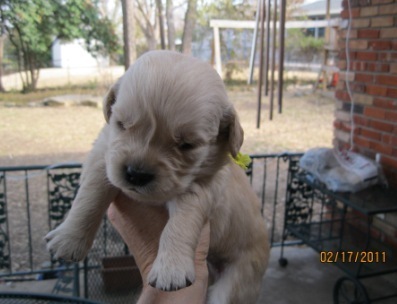 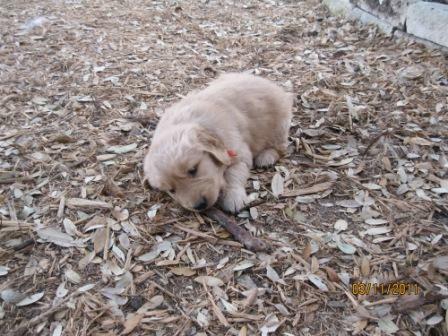 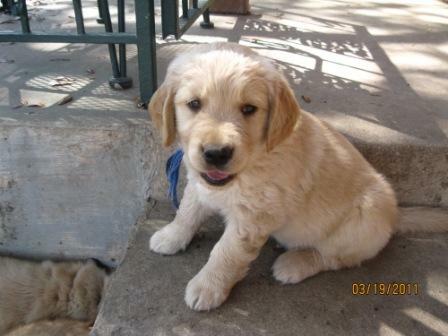 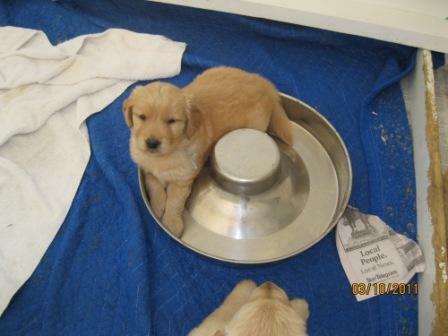 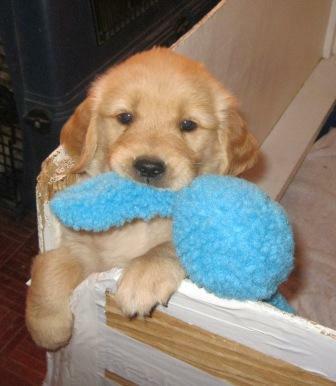 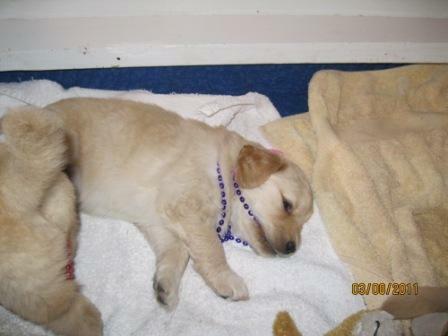 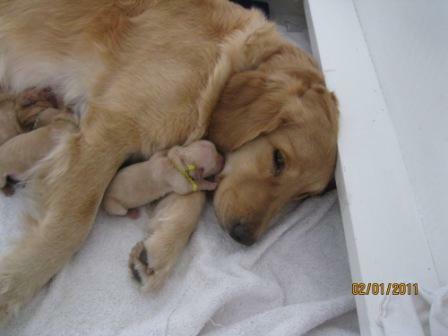 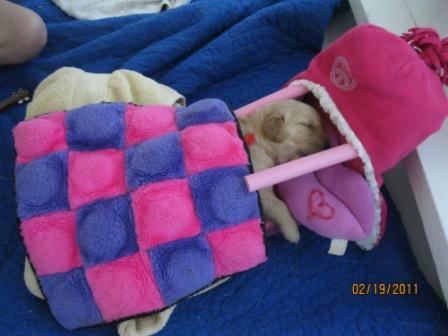 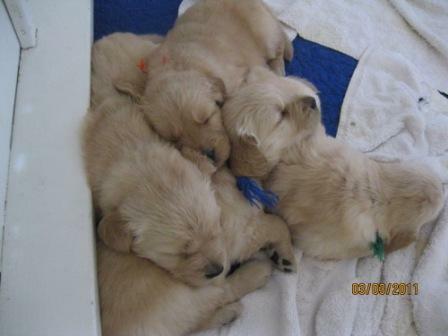 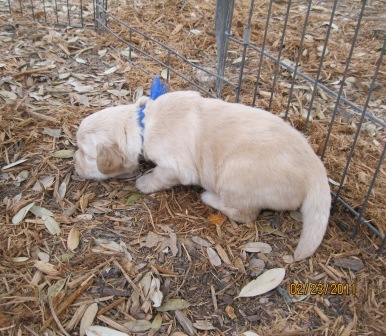 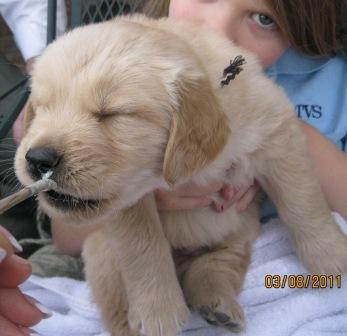 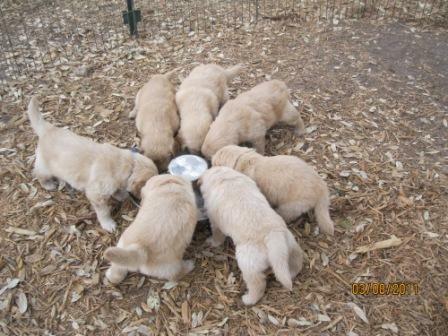 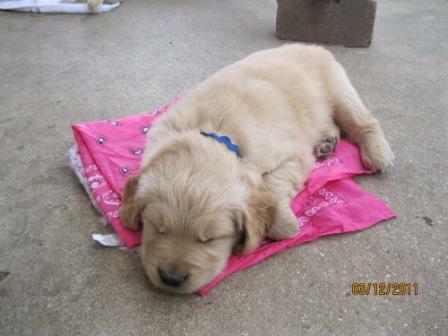 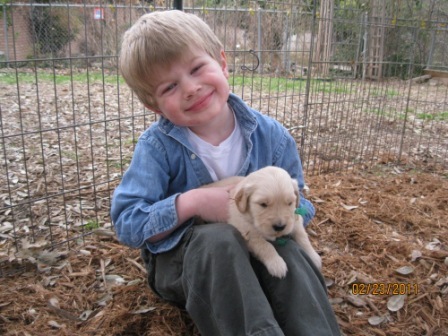 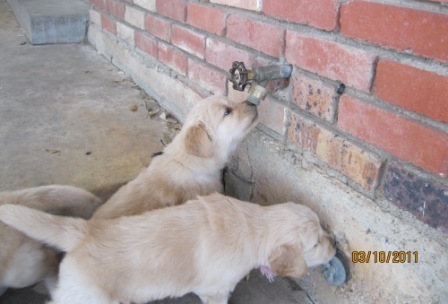 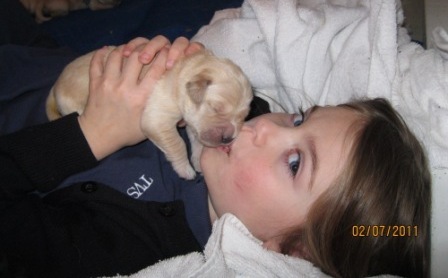 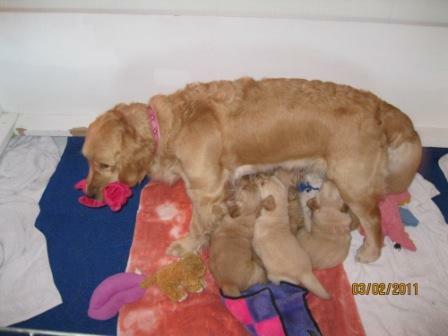 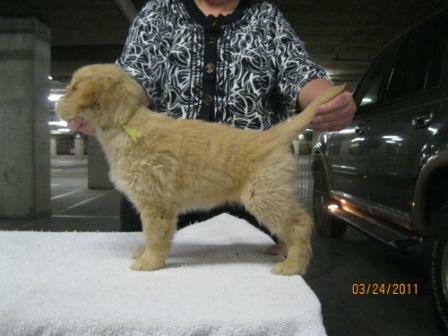 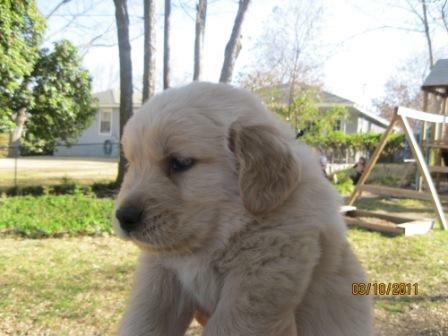 To see the puppies "growing up", go to "Piper Puppies"